Greetings from the Complicated Art Man. It's that Fall-ish time of the year here in Central Florida. I took most of the summer off from art projects and it's getting to be that time again for new ones. Hurricane Irma really did some significant damage here in the Orlando area and several trees were blown over. I picked up a couple of wood stumps and decided to give them new life. Those art projects are currently in their infancy stages and I will post about them when they're finished. In the meantime, I've had a couple of growler bottles I've been working on and finally have finished them. I decided to go with a Florida seascape theme for both. After a recent trip to St Augustine, I was fortunate enough to catch the sunrise on the way back home. I caught a few shots of the sunrise over the Atlantic and have been pondering on them for a bit. After a couple of sketches in my journal, I was finally ready to do up the growlers. Once again I took to the "lazy Susan" technique. I started off by priming the bottle with a couple of coats of flat black spray paint. 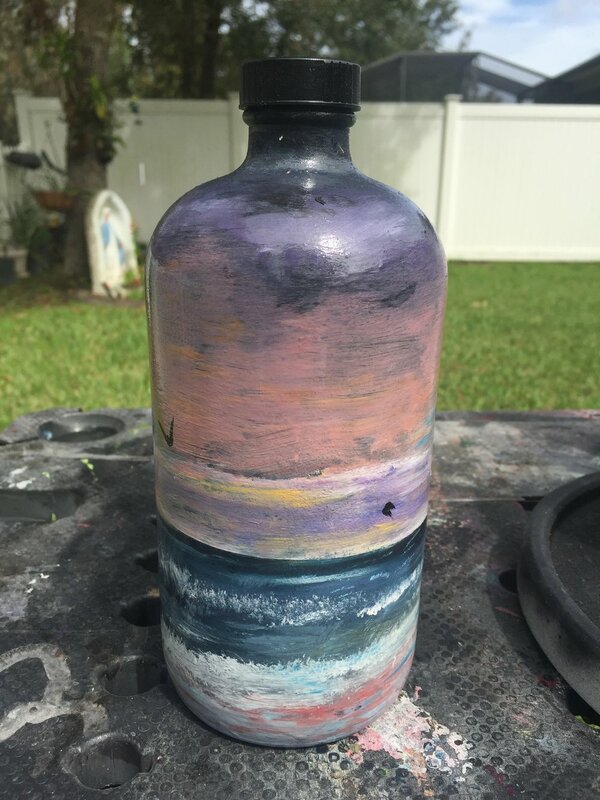 If you have never tried painting on a bottle without priming it, good luck getting the paint to stick. I use a lot of wet on wet technique and it doesn't work without first priming the bottle. I like to go with the flat black base because it really makes the colors pop once you begin blending. 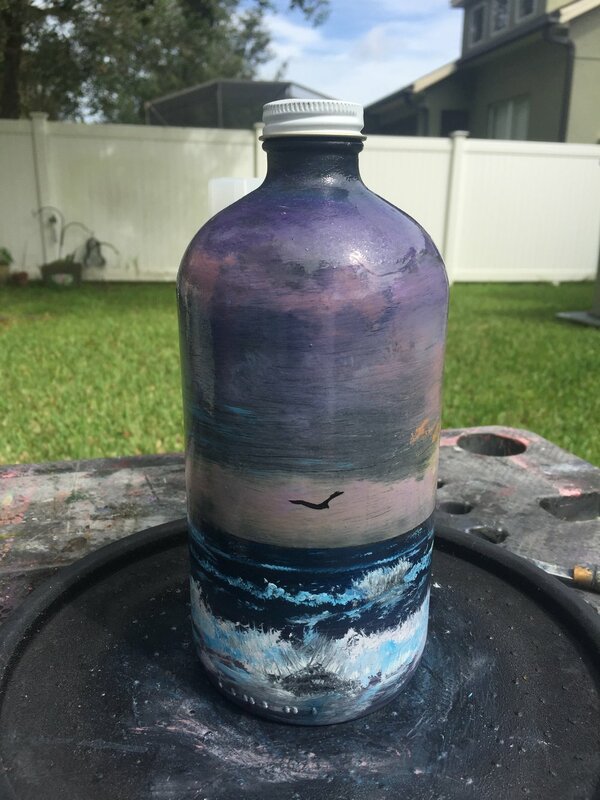 It takes a hot minute to figure out how to handle the growler while painting on it, without smearing the paint. For that, you'll just have to figure out which way works best for you. One of these growlers is going to end up at my friend's restaurant in St. Augustine, Brewz N Dawgz. The owner Roger Lim, was gracious enough to gift me a growler. This will be the temporary home for the growler, until it makes its way to a permanent home. I'm excited to start my next projects which will be painted on wood, cut from the stumps that I saved from Hurricane Irma. I will keep you posted.